Although I had previously tried Rochefort Trappistes 8 (May 2017) and Rochefort Trappistes 10 (May 2013, July 2014, Nov 2017), I had yet to try the Rochefort Trappistes 6 until this last May. Unfortunately, while I've now tried all three gravities, I wouldn't know which one is the best; they're all great. Explicitly, I've independently rated them as 4.3 stars (R.T. 6), 4.5 stars (R.T. 8), and 4 & 4.3 stars (R.T. 10). However, in the event I ever tried all three in a blind taste test, I'd probably most enjoy Rochefort Trappiste 8, then 6, and then 10. My previous notes suggest that 8 has just enough of a strong taste that would be consistently agreeable, while 10 might occasionally be too strong for me and 6 is strong, but not as strong as 8. Certainly, this would depend on my mood, what I've previously eaten (or not), and what I've previously drank (or not). 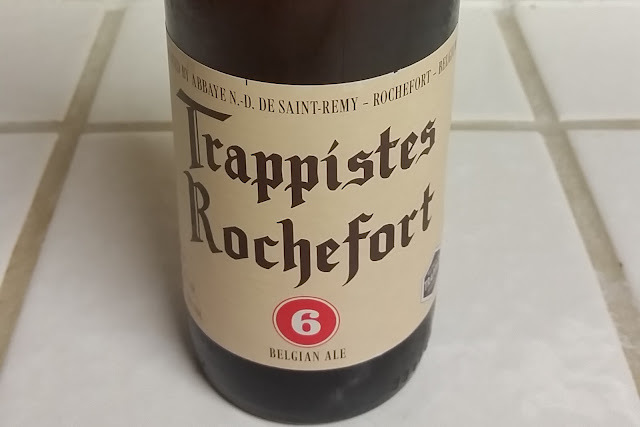 In any case, while I recommend you also try all three, perhaps it's best to start off with the one closest in ABV (alcohol by volume) to the beer you normally enjoy drinking: Rochefort Trappiste 6 is 7.5% ABV, 8 is 9.2% ABV, and 10 is 11.3% ABV.